As you probably noticed, quite often I'm writing about being efficient and productive. As a father of six plus one on the way with a "normal" job, my time resources are very limited. All that forced me to think more about time management! 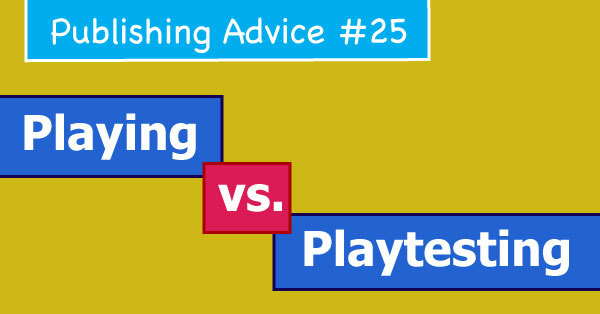 And as you probably already know (especially if you are reading my blog), playtesting is one of the aspects where you can waste a lot of time. And I'm often seeing that some designers and publishers are advertising their games as playtested 100 times or even 1000 times. But that can be quite misleading as not everyone understands what playtesting means. Did you ever think that playing a prototype doesn't mean playtesting it? Are you really playtesting your prototype? Actually, it's critical to distinguish these two things. Let's then have a better look on this! There are hundreds of reasons why you might play a game. They might be conscious or unconscious. You can play published games, and you can even play your prototype. When you and other people are playing a prototype, that doesn't mean you are playtesting it! So when we can say that you are playtesting your prototype (not just playing)? It is very simple - you have to know which element of the game you are testing or what are you checking! - Testing chosen single mechanic in the game. Looking how the game works as a whole. A designer is looking for downsides and how to improve them. - A bigger picture. Every now and again designer wants to have a closer look how all elements work together. - Checking the balance of certain elements of the game, for instance, the balance between action cards and movement cards. - Testing which emotions are stirred. Do you want the players to concentrate on their moves and think a lot, or you want them to laugh and stay relaxed, or maybe you want them to bid, talk a lot or argue? - Checking if the players are bored and why! Find the reason and start working on it. - Checking why it takes so long to finish the game. Try to answer the question why it takes so long and which mechanics and elements of the game are responsible for that! - Looking for bugs and holes in the game. - Testing newly added, changed or replaced element or checking how's the game working after removing an element. After you recognise a problem, try to resolve it. One by one playtest each solution. Recognise if applied changes are working as expected. Are they spot on or do you need to get rid of them and try something else? Make sure you plan your playtesting session. Make notes during and after playtest, and then do some changes if needed! Change ONE element of the game at the time! You can check few elements during your playtests - that's no problem! But please remember to change one element at the time. If you start changing multiple elements, you'll get lost. You have to name the issue you found, address it and then fix it! If you name the issue, but then if you can't address it, and you'll start to change few elements, you will have no clue which one caused the problem. Even worse, there is a big chance to damage things that are already working very well. The goal is to fix up not working part of the game without messing up already balanced one; however, sometimes you might have no choice. I hope you enjoyed this article. I found myself just playing games I supposed to playtest many times in the past. It's an obvious thing, but very easy to forget about! I'd like to again thanks, Ignacy Trzewiczek for inspiration! Did you find yourself playing your prototype instead of playtesting it?